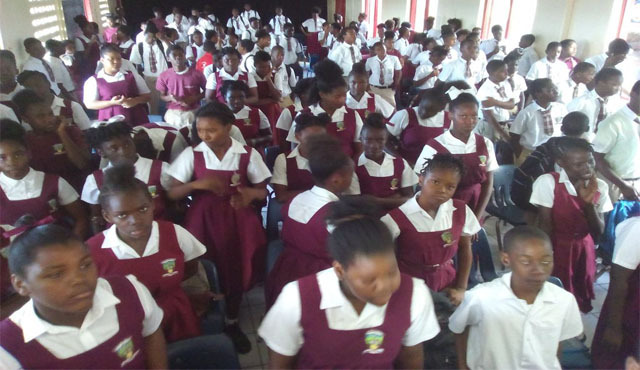 Basseterre, St. Kitts, Tuesday, 5th February, 2019, (MyVueNews.com) – Education and health officials in St. Kitts have confirmed that they are currently taking action and have launched an investigation to find the cause of a recent incident, involving students at the Verchilds High School, who complained of medical issues, following work they completed in the science lab. It was last Friday, 1st February, 2019, when students at the institution first reported that they were experiencing the appearance of spots on their arms and palms. As a consequence, the Ministry of Education issued a statement saying that they dispatched a team of officials to the school to look into the matter. “The way forward is that the Ministry of Education would provide the necessary support for all those who were affected. The Department of Health is working with us to provide the necessary testing,” assured the Acting Chief Education Officer, (CEO), Darryll Lloyd. The CEO said, that the ministry has decided to incur the cost for medical expenses related to the treatment of the affected children. He said that parents were asked to submit the necessary medical documentation to the principal of the Verchilds High School. “After speaking with the school we would have communicated with the Chief Medical Officer (CMO) Dr. Hazel Laws in relation to the information we received and she was able to provide two health officials in the persons of Director of Community Health Services, Dr. Keisha Liddie; and Deputy Chief Environmental Health Officer, Jermaine Lake,” stated the acting Chief Education Officer. It was also reported that Deputy Prime Minister and Ministry of Education, Shawn Richards, was also on the ground trying to find out what had transpired. Lloyd explained that upon arrival at the school, the team from the Ministries of Education and Health met with the affected students to seek to determine the root of the issue at hand in order to deliver a prompt solution as quickly as possible. Parents of the involved students were invited to a meeting at the school on Monday, February 4th at 9:00 a.m. Lloyd stated that during the meeting parents and teachers naturally had a number of questions based on their concerns for the students. “The school was asked to submit a report with respect to the chemicals that were used during a recent experiment that was conducted in the lab, given that the spots only appeared on the hands and arms of those who have been in the lab since then. The CMO assured us that the Ministry of Health would provide the necessary testing to determine what would have transpired and the way forward,” Lloyd told the Education Media Unit. Following the initial meeting with parents, affected students and teachers, the Ministry’s representatives, including the acting CEO; Assistant Chief Education Officer, Debbie Isaac; and Ministry of Health representatives convened a second meeting with the general school body. (Featured file photo: students at Verchilds High School).